Overview - Director/producer Garry Marshall brings together an stellar ensemble cast to celebrate love, hope, forgiveness, second chances and fresh starts, in intertwining stories told amidst the pulse and promise of New York City on the most dazzling night of the year. Have you ever found yourself watching a movie, and sort of just wished that you could fall asleep? I ask this because that's exactly how I felt while watching 'New Year's Eve.' I just wanted to close my eyes and drift off into a deep slumber, where I'd be safely out of the movie's nefarious clutches. The problem was, I wasn't particularly tired. Well, that and it's technically my job to review the movie, so I kind of had to stay awake. I didn't want to, mind you. I really didn't. An over-bloated, painfully generic, wholly disposable and totally lifeless exercise in regurgitated filmmaking, 'New Year's Eve' is simply awful. Despite an almost obnoxious smorgasbord of talented stars, it's still awful. Despite some genuine attempts at being sweet, it's still awful. Despite a script that seems like it was written by a focus group committee aimed at appealing to the widest possible audience without offending anyone, it's still awful. Did I mention it's awful? What's that? You want more reasons? You want me to continue elaborating? Really? You poor, misguided fool. OK, fine. Read on, but don't say I didn't warn you. The story is an ensemble piece that follows a group of interrelated human-like beings (they’re all far too attractive and thinly developed to be actual people) as they interact together on New Year's Eve in the Big Apple. Throughout the evening, various romantic subplots develop between the sprawling cast (which includes the likes of Jessica Biel, Ashton Kutcher, Lea Michelle, Robert De Niro, Katherine Heigel, Sofia Vegara, Michelle Pfeiffer, Zach Efron, and, for some reason, Jon Bon Jovi). As their relationships go through tumultuous ups and downs, the film ultimately climaxes during the traditional ball drop in Times Square, just in time for all the narrative threads to wrap up nicely with a kiss and a sip of champagne. Whoops! I guess that could be considered a spoiler. Forget I said that. What I meant was, just in time for shocking revelations and a series of not at all predictable conclusions. Hell, maybe there's even a murder. Or an alien invasion. Or a robot uprising. I'm not telling. The main problem here (though there are many) is the truly unoriginal script. The screenplay is essentially a patchwork quilt of clichéd sitcom scenarios. Really, I'm not joking. It literally is a stringed together "greatest hits" collection of plotlines we've seen on everything from 'The Brady Bunch' to 'Full House.' A young girl vying for her first kiss? Check. Someone trying to complete a list of farfetched resolutions? Check. A broken up couple reconciling? Check. A dying man wishing to see the ball drop one last time? Check. Two attractive strangers trapped in an elevator? Check and mate! Hell, I could even keep going. Of course, just because we've seen all these subplots before doesn't necessarily make them bad, but the writer fails to do anything fresh or even slightly amusing with the already stale material. Links are forced between otherwise unrelated characters in order to tie storylines together in sometimes laughable ways, and everyone ends up having far too many convenient connections between them. Jokes are recycled from past efforts and the attempts at romance and drama are so artificially manufactured that any real emotion gets swallowed up. To add insult to injury, none of the stories are really given enough screen time to develop, and director Garry Marshall basically moves from plot to plot like a rotating assembly line. With that said, I'm not really sure expanding on any of the stories would have actually helped in this situation. What is present is already so banal that any additional minutes of mediocrity would likely only aggravate the problems. I often wonder why talent like this (which includes the likes of Halle Berry, Seth Meyers, Carla Gugino, John Lithgow, Sarah Paulson, Abigail Breslin, Sarah Jessica Parker, and, for some reason, Chris "Ludacris" Bridges) is so often drawn to such obviously second-rate projects. In reality, the answer is probably simple. With such a massive roster of actors and storylines, the shooting schedule for each performer is likely quite small. Add in the fact that the script doesn't exactly call for a terribly taxing range of emotions, and mindless drivel like this must suddenly seem like a decent, quick gig to take in between better work. I mean, how else does one explain the nearly comical carousel of stars in the movie? In fact, there are so many notable names in this flick that it gets downright annoying. Even the extras are recognizable. Seriously, Alyssa Milano is in this flick for about five seconds as nothing more than a glorified background player. While the filmmakers hope that any shortcomings in the script will be elevated by the sheer charm of the ensemble, unfortunately, that just isn't the case. Sure, some of the actors seem to be offering a genuine effort, but about half of them are clearly phoning it in. Though serviceable and unobtrusive, Marshall's direction doesn't help matters much either. It's all just so… empty. 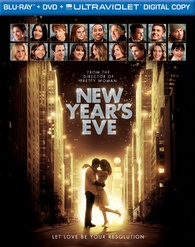 Warner Bros. presents 'New Year's Eve' on a Blu-ray/DVD/Digital Copy combo pack. The flipper disc (BD-25 on one side, DVD on the other) is housed in a keepcase that comes packaged in a cardboard slipcover. After some skippable trailers the disc transitions to a suitably generic and boring menu with truly atrocious background music. An insert with a code for a redeemable UltraViolet digital copy is also included in the package. The movie is provided with a 1080p/AVC MPEG-4 transfer in the 1.85:1 aspect ratio. Bright and colorful, this is a nice looking transfer that renders the film's broad style well. The digital source is clean and pristine with only a hint of noise here and there and no major artifacts. Detail is solid with a nice sense of depth and pop throughout. The bright, commercialized lights of Times Square absolutely sparkle and one can make out every tiny speck of confetti that takes flight during the holiday celebration. Some shots can look a bit soft, however, and there's even a very faint hint of smearing in a scene or two. Colors are very vivid and bright, but the slightly oversaturated palette might prove too overwhelming and unrealistic to some. Contrast is high and black levels remain deep and inky throughout. Keeping in tone with the content, 'New Year's Eve' features a very basic visual style, and while not exactly exceptional, the video suits the material well. Crisp, bright, and cheery, there's really nothing to complain about here. The audio is presented in an English DTS-HD MA 5.1 track along with optional English SDH, French, Spanish, and Portuguese subtitles. Additional French, Spanish and Portuguese Dolby Digital 5.1 tracks are also included. Perfectly serviceable with a few lively bursts, this is a solid but easily forgettable mix. Dialogue is clean and crisp throughout. Directionality across the front soundstage is decent, and the film's pop music soundtrack features solid stereo separation. Surround use is sporadic, but some faint ambiance, music cues, and occasional isolated effects (a creaking elevator, for example) do hit the side speakers. Dynamic range is good and distortion free, but not terribly wide. With that said, a few musical performances from Bon Jovi and Lea Michelle are particularly impressive, offering strong fidelity (as bad as the movie is, Michelle's voice is still wonderful, and Bon Jovi is… Bon Jovi). Some decent low frequency activity kicks in during these songs and in some of the other soundtrack choices, but bass activity is otherwise slim. All of the audio elements are balanced well together with no drowned out speech or effects. I think it's safe to say that you probably won't be popping in 'New Year's Eve' to demo off your sound system anytime soon (or at all, for any reason) but the mix does what it needs to do. It's never totally immersive or enveloping, but for a film of this type, the track gets the job done just fine. Warner Bros. has put together a pretty superfluous set of supplements that will likely only appeal to huge fans of the movie. All of the extras are presented in 1080p with Dolby Digital 2.0 sound and the same subtitle options as the main feature. Commentary with director Garry Marshall - Marshall comes across as a genuinely nice and very enthusiastic man. Unfortunately, he spends the entire track making simple observations while pointing out where scenes take place, who is in them, and what's happening on screen. A few bits of production information and trivia are offered, but, for the most part, this is an easily skippable commentary. That is, unless tidbits like Marshall's staunch belief that actor's who like to wear hats should be allowed to wear hats and those who don't shouldn't have to, sound insightful to you. If that's the case, then by all means take a listen. The Magic of Times Square (HD, 6 min) - In the first of several fluffy promo pieces, the cast and crew discuss the allure and tradition of New Year's Eve in Times Square. Some extremely quick behind-the-scenes snippets are peppered throughout as well. Basically, there is nothing worth hearing here. New Year's Eve Secrets of the Stars (HD, 6 min) - More cast and crew interviews are provided, this time discussing how they usually spend New Year's. The stars also share their own resolutions. I'd list a few of them here, but honestly they were so banal that I actually can't remember any... and I just watched this a few minutes ago. Jon Bon Jovi & Lea Michelle Rock New York (HD, 5 min) - This is a brief behind-the-scenes look at the recording and filming of Bon Jovi and Lea Michelle's musical performance. Much is made of the fact that Bon Jovi supposedly came out of acting retirement to make this film. This being such a big deal perplexes me on many levels. Deleted and Extended Scenes with Introduction by Garry Marshall (HD, 17 min) - A collection of excised material is presented with or without introductions by Garry Marshall. If you're on the fence, I highly recommend watching them with the intros because Marshall's rambling, simplistic, and sometimes completely bizarre rationale for removing the scenes can be quite entertaining (John Stamos was cut out of the movie because the director didn't like his mustache). In fact, I'm now convinced that Garry Marshall should produce introductions for all supplements. On all discs. The scenes themselves are extremely short (most are only a few seconds) and are pretty worthless. With that said, I actually found Stamos' ridiculous mustache to be much more entertaining than anything left in the film. 'New Year's Eve' is a star studded dud. The characters are paper thin, the story plays out like a cheesy sitcom highlight reel, and despite some (likely) genuine efforts, everything feels empty and artificial. The video quality is good with a bright and colorful picture, and the audio is solid with a few well produced musical performances. Supplements are fluffy and worthless, however. If you really loved Marshall's similarly produced 'Valentine's Day,' I guess there's a chance you might like this as well. All others are advised to avoid this one.